A common fear for patients considering dental implant surgery is that it will hurt. After all, the idea of having titanium implanted in your jawbone probably doesn’t sound like the most pleasant experience. Certain keywords surrounding dental implant surgery often elicit fears in patients. For instance, “pins, screws, bone, and surgery,” all trigger the idea of pain, even though the reality of the treatment is rarely painful. In fact, most dental implant patients confess that their dental implant treatment didn’t hurt, and the discomfort afterwards was minimal. Today, we’re going to walk you through the dental implant process to ease fears of pain, as well as explain some ways to take care of yourself to minimize discomfort after your treatment. Is There Pain During Dental Implant Surgery? Dental implant treatments are a process that are performed over a few months. Most of these months are spent outside of our office. In the initial treatment, an incision is made in the gum, where the implant is placed into the jawbone using a titanium screw, a material that fuses to the jawbone and takes the place of the root of the original tooth. Next, the gums are sutured around the implant, and the implant is left to heal for 3-6 months, depending on the amount of time it takes your jawbone to fuse to the implant. Once the implant is healed, an abutment is placed over the titanium implant, which is then attached to the crown, or the part of the restoration outside of the gumline. 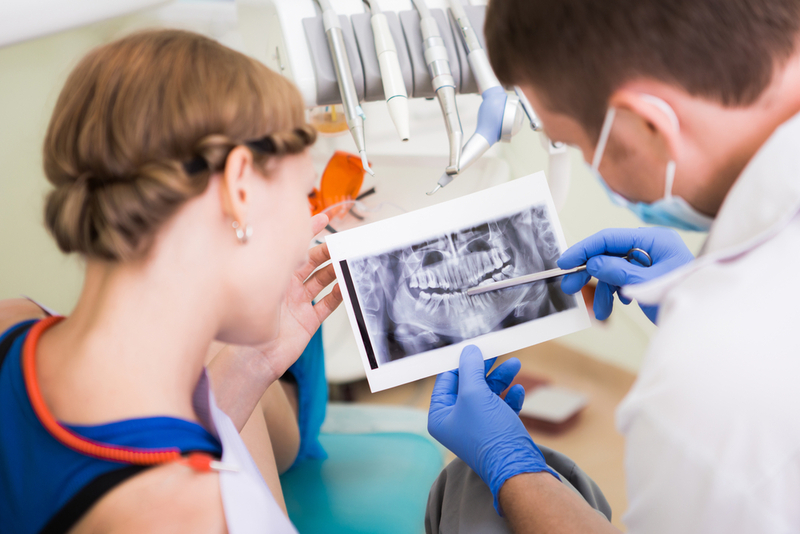 While this might sound like an incredibly painful process, many patients attest that there is far less discomfort than having a tooth extracted. During the treatment, we will use a local anesthetic, which completely numbs the treatment area. Not to mention, the bone where the implant is placed doesn’t have many pain-sensing nerves, combined with the fact that patients often opt for sedation options to ease nervousness and feel more comfortable during their treatments. Is There Pain After Dental Implant Surgery? Following your surgery, you might experience some discomfort for a few days. At the same time, the pain will be manageable, and we will prescribe a form of painkillers, like Ibuprofen, to help manage the pain. Many patients admit to feel discomfort around their chin and cheeks, while experiencing swelling and minor bruising in the gum area and around the implant site. Keep in mind that pain after implant surgery is temporary, and most patients do not find it a problem at all. One way to help manage pain is taking care of yourself during the recovery process. Avoid foods that cause inflammation, like spicy foods. Stick to cold and soft food, like smoothies, yogurt, and ice cream for a few days after your treatment. Take your recommended painkillers to help with post operative discomfort. If you’re still experiencing discomfort, don’t delay contacting our dentist, since this could be a symptom that something went wrong. Loose implant. If you have low jawbone density, then applying pressure to the implant could cause it to come loose. However, our dentist will ensure that your jawbone volume is healthy, before we move forward with inserting the implant. In the off chance that this complication occurs, the implant will need to be removed. Rejection. In rare cases, your body might reject the implant. If this occurs, we will recommend an implant created from another material, or another tooth loss solution. Infection. Improper dental hygiene, drinking, or smoking after your surgery can lead to infections that will need antibiotic treatments. While complications after dental implant treatments are rare, if you have any swelling, signs of infection, or inflammation after 5-10 days, you should call our office, so we can minimize discomfort and save your implant. It is our goal to provide an effective treatment with as minimal discomfort as possible. Therefore, the quicker you contact our office, the higher the chance we can save your implant. Want to learn more about our dental implant process and sedation options for restorative treatments? Call our office today at .